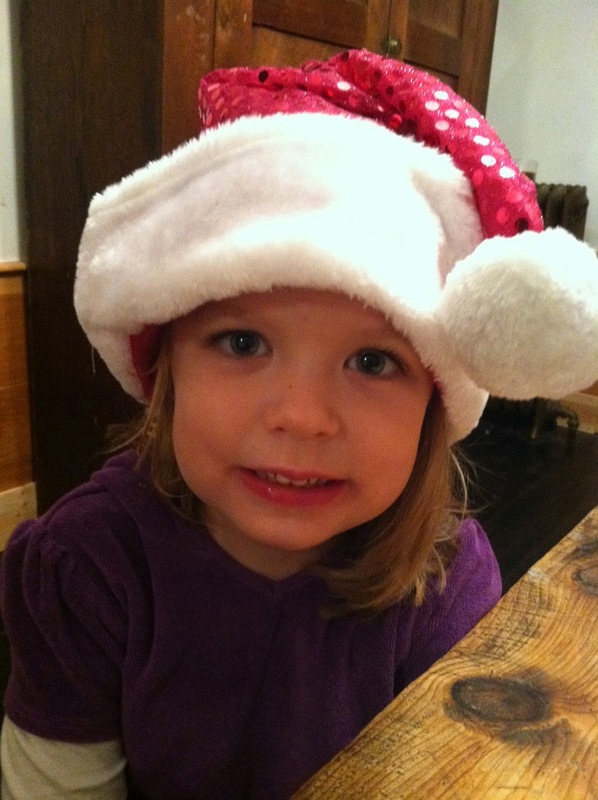 First and foremost, I need to tell you that my kids freaking rock. They understand that I love running and that fitness is important to me. Now that it's getting colder and darker earlier, it's not as easy to bring the kids along with me when I run. Tucker's not a huge fan of riding his bike in the snow and slush and Izzy really dislikes hanging out in the jogger getting pelted by ice balls in the eyes or having layers and layers of blankets on her at an attempt to keep her warm from the brutal winds. Ward's schedule just plain old stinks right now. So if I want to run, I can roll out of bed at 4:30 am and fall asleep at 6:30 pm…. or I can head to the gym, bring the kids along with me, and get some treadmill miles in. 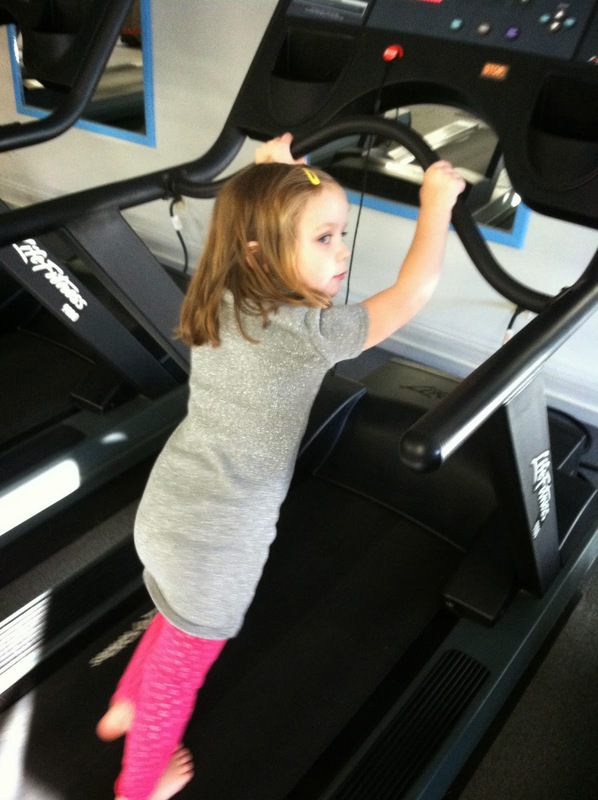 these kids spend a lot of time at the gym…..
she'll be running on this in no time! So back to why my kids rock. They have spent the last few days hanging out at either the gym or in my classroom while I ran in the school fitness center so mommy could get in some treadmill miles. We prepped by packing a bag of drinks, snacks, and electronic devices - so they'd be fed and entertained. Then I usually follow it up by adding in some other incentive - like last night's incentive was "you can choose whatever you want for dinner". By the way - they chose chicken wings and mozzarella sticks from the "wing bar" or whatever you want to call it from our local Hannaford. Izzy wanted this hat too. She let me run. I couldn't say no. Anyway, Monday night I let them choose - the gym or my school. They chose to go to my school - which meant they get to hang out and destroy my classroom while I run on the treadmill a few doors away in the fitness center. Trust me, I'll take a messy classroom anyway if it means I can get some miles in! 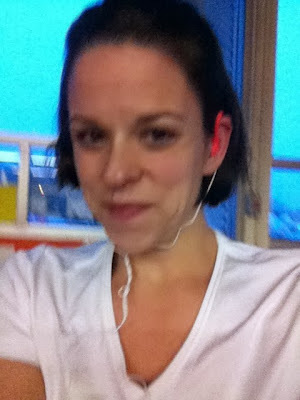 And I got to try out a some new Koss Fit Series I received yesterday as part of a FitFluential Campaign. Be on the lookout for my full review! I cranked out those 5 miles for Laura @ Mommy Run Fast's Fall 5 & 10, with some awesome new earbuds and my kids were happy. Awesome! Which is why I responded to Ward with this pic a few miles into my run, when he texted me to see how my day was. Of course I'm smiling! Yeah, it's on the treadmill. Not my favorite. BUT, I'm running! Woohoo! As I went to enter my time on the spreadsheet - I noticed something that made me smile. Oh, you know you see it!!! Look at that time going down! Progress baby! Tell me, do you bribe your kids so you can get in a workout? LOL - I can't image why they wouldn't want to tag along outside ;-) That's great though that you have options and they are able to go with you. And yay on the time improving! Your kiddos are great, mine are also pretty happy if they have some electronics to play with and my purse to get "snacks" at the cafe at gym. LOVING the steady downward spiral of the 5mile times AWESOMENESS, well done. Kids are awesome! Love it! Oh we make it work!!! And bribery goes a long way with them!!! I loved his first book and loved this one. I absolutely will recommend it to my clients. I love that he gives people the tools to really find out their needs, not some generic average person's needs. My clients are each very different and there's no one-size fits all. I also really like that he gives a list of what successful people are doing right rather than everything everyone does wrong. Ooh, awesome progress! And that is so fantastic that your kids are so cooperative. My daughter is not a big fan of the childcare at our gym, but I really need to try it again. Ahh, I don't have children but I love this story! Your children are such sweethearts! It must make you feel good that in their own way they are supporting their mommy's running!